Edward A. G. Schuur, James Bockheim, Josep G. Canadell, Eugenie Euskirchen, Christopher B. Field, Sergey V. Goryachkin, Stefan Hagemann, Peter Kuhry, Peter M. Lafleur, Hanna Lee, Galina Mazhitova, Frederick E. Nelson, Annette Rinke, Vladimir E. Romanovsky, Nikolay Shiklomanov, Charles Tarnocai, Sergey Venevsky, Jason G Vogel and Sergei A. Zimov. Thawing permafrost and the resulting microbial decomposition of previously frozen organic carbon (C) is one of the most significant potential feedbacks from terrestrial ecosystems to the atmosphere in a changing climate. 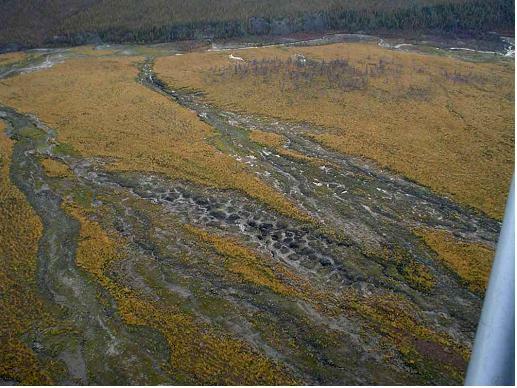 In this article we present an overview of the global permafrost C pool and of the processes that might transfer this C into the atmosphere, as well as the associated ecosystem changes that occur with thawing. We show that accounting for C stored deep in the permafrost more than doubles previous high-latitude inventory estimates, with this new estimate equivalent to twice the atmospheric C pool. The thawing of permafrost with warming occurs both gradually and catastrophically , exposing organic C to microbial decomposition. Other aspects of ecosystem dynamics can be altered by climate change along with thawing permafrost, such as growing season length, plant growth rates and species composition, and ecosystem energy exchange. However, these processes do not appear to be able to compensate for C release from thawing permafrost, making it likely that the net effect of widespraed permafrost thawing will be a positive feedback to a warming climate. 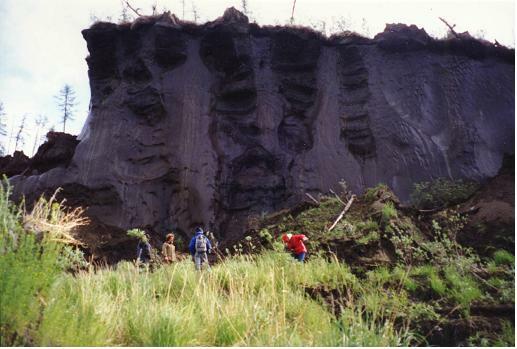 Frozen sediments (Yedomas) in Eastern Siberia.